This contemporary water feature will provide a stylish focal point for your outdoor space. Its curved, stainless steel design is sleek and elegant. It is a must-have for any modern garden. 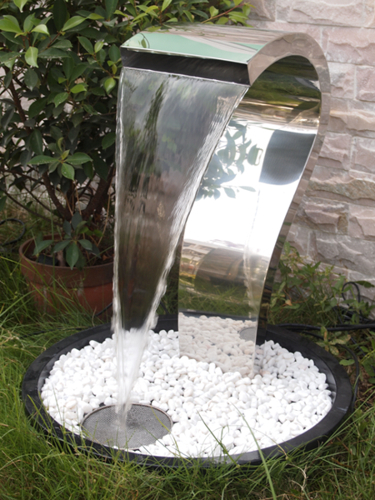 This beautiful stainless steel water feature boasts a stunning, contemporary aesthetic. The feature is fully self-contained, so it requires no additional reservoir – the basin collects the water that cascades from the blade and recirculates it through the feature. The integrated LED cluster allows you to enjoy your water feature even at night. Please note: pebbles are not included.